I know the main reason most of you visit this blog is for quilty/fabric/sewing inspiration, not travelouges. So bear with me today. 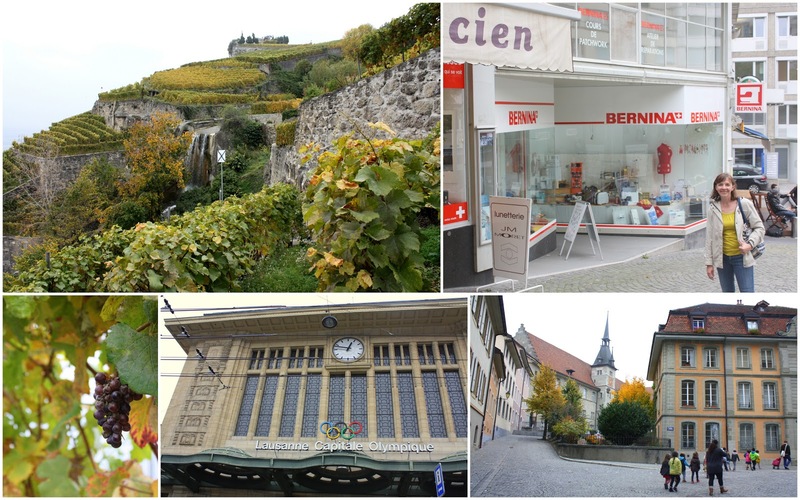 I thought I would share a few pictures from our trip to Switzerland last week. I think Switzerland is pretty easy on the eyes, so I figured there might be a few who wouldn’t mind sitting through some trip pictures. There’s still a little stitching involved as well. The real reason (excuse) for our trip was that my husband was invited to come consult and train employees at a company conference in Geneva, Switzerland. Since his trip was paid for, we figured it was an opportunity not to be missed, so we scraped together a plane ticket for me to tag along. (I know. I’m such a good sport to not make him go alone.) Neither of us had ever been to Geneva before. While my husband was in his meetings, I kept myself thoroughly entertained exploring the old city. Here’s a sampling of some of the shop windows I passed. 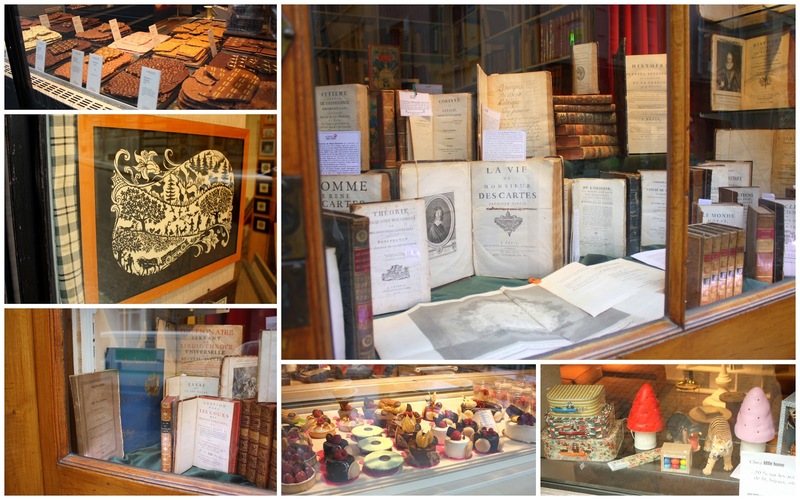 Lots of chocolatiers and specialized patisseries (pastry shops) as well as antique, book and children’s shops. Also some incredible scherenschnitte (intricate paper cutting). As I was walking through the old, medieval part of the city, I just happened to see a little stitchery shop called Mercerie Catherine. The inside was cozy and stuffed to the gills with patterns and samples (mostly cross-stitch and embroidery) as well as beautiful lace, ribbon, threads, and woven cloth for stitching. Of course I especially loved the swiss-themed patterns and pictures. I’m a total sucker for red and white – I feel inspired to finally make a red and white quilt this Christmas. I thought it would be fun to buy a little bit of ribbon and trim as a memento so I picked the Swiss cows and flags as well as the ‘Poulets’ (chickens). I got a meter of each and when the owner told me the price I about died at how expensive it was for three little meters of trim! Yikes! By then it was already cut and my French was not good enough to get myself out of it, so I now need to think of something extra special for my expensive little trims! 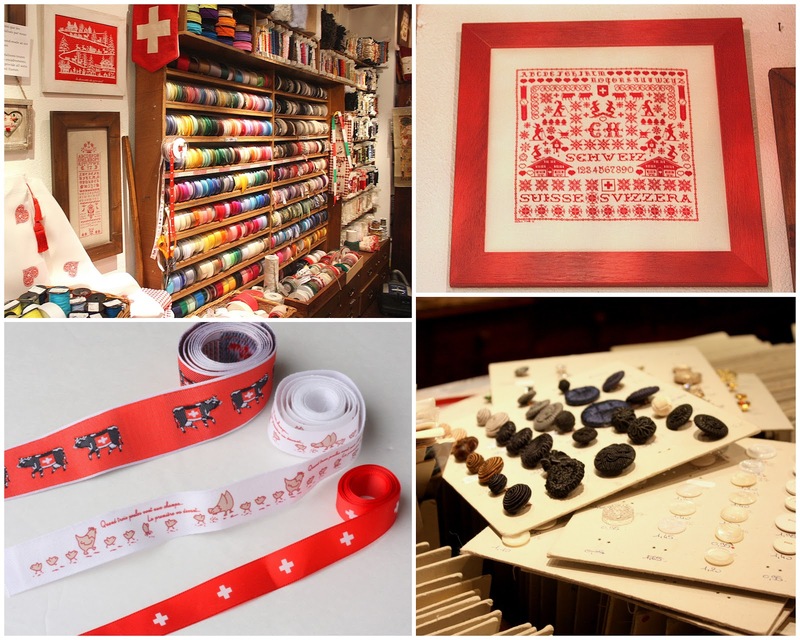 I love to collect Christmas ornaments from other countries, and didn’t find any on this trip, so I think I’ll use some of my trim to make my own commemorative Swiss ornaments. That might help assuage my sticker shock. 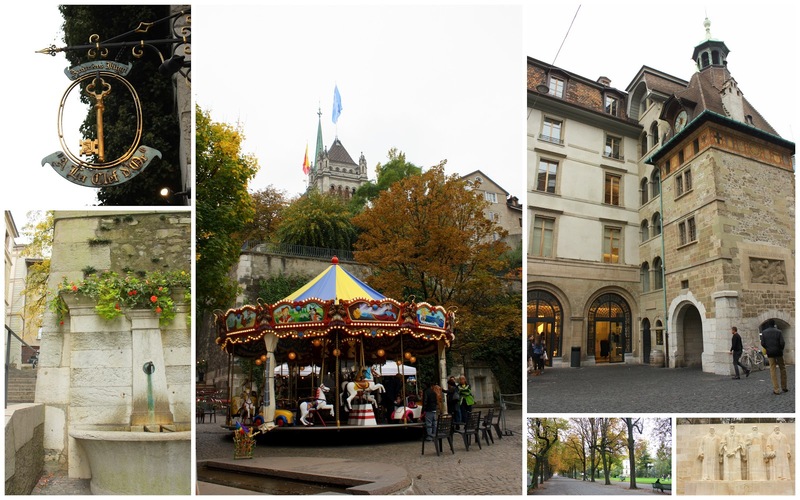 Lausanne was another charming old city. While there we passed a Bernina vendor- one of my very favorite Swiss exports. (Felt appropriate since I love my Swiss-engineered Bernina!) Just beyond Lausane were incredible vineyards built on terraced hillsides. I’ve never seen anything like it – I can only imagine how spectacular they look on sunny days with the lake as a backdrop. On our final afternoon in Switzerland, we decided to try driving to see some Alps. 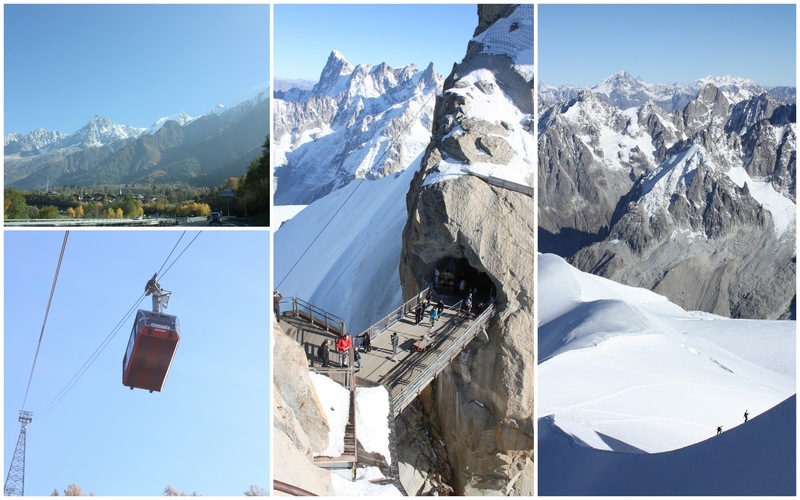 We didn’t have time to visit central Switzerland on this trips, but we were close to the French alps to the south – only an hour away in Chamonix, France. My husband is a mountain lover especially and liked the idea of riding the tram to see Mont Blanc. We were so happy the skies were clear so that we finally got to see the spectacular alpine views. The tram ride was exciting (if not a little stomach lurching at moments) and the views from the top were incredible. There was a way-station carved out of and built in the rock of the mountain. It felt like being inside the Matterhorn ride at Disneyland, only it was the real thing! And no, that’s not us doing the mountain climbing in the picture on the right. I have a few more pictures to share from Paris, but there’s enough that I’ll save the traveloguing for another post. I still can’t believe we were actually there. Now that we’re back in the normal routine it all seams like a dream. I feel so lucky (and a little spoiled) to have been able to go, but I’ve learned from missed chances in the past, to grab opportunities when they come, because you never know when they’ll come again! Beautiful! Thanks for sharing these treats with us! What a fun treat to be able to travel there! Thanks for sharing your pictures! It looks like such a fun place to visit. Absolutely gorgeous, thank you for sharing your beautiful photos and those old stores look amazing. Beautiful photos. Looks like a great trip. How amazing! I think anytime you have a chance to go visit a new place or a foreign country, it&#39;s a great idea to jump on it. I love the photos of the French Alps, so lovely. What a great opportunity for you. I&#39;m glad you jumped at the chance. And thanks for sharing the beauty with us! Love the photos and commentary. what a great experience. I think ornaments would be a great project for that pricey ribbon (I think she pulled your american leg). How fun though. I love your pictures. I like to see other peoples trip pictures. It makes me feel that I went on the trip. Beautiful pics! My husband goes yearly to Geneva for work (for a European air show) and yes, it is very expensive there–but I still plan to go along one of these times. He also has shared similar pics like yours of Mont Blanc and Lake Geneva but, gee, he didn&#39;t seem to have one of the Bernina shop! Apparently I haven&#39;t made it clear enough how much I love mine!? Since I&#39;ll probably never make it to Switzerland, I enjoyed looking at your photo&#39;s. Thanks for sharing! And I think you are very lucky to have been able to take such a fabulous trip. I&#39;m sure with all of your husband&#39;s travels, it&#39;s nice to get a few perks here and there. I&#39;m so happy for you guys, what an incredible trip to have gone on..love the pictures. I enjoy your posts to watch your work and share what you are willing to share–so these were a treat! Thanks for letting us see some of your sightings! It looks wonderful and I am glad you took advantage of the opportunity!! I&#39;m so glad that you were able to seize the moment and go! Travel, it&#39;s something I dream of doing. Absolutely amazing pictures!!!!! WOW!! Thank you for sharing. One day I hope to visit there. I love this post! 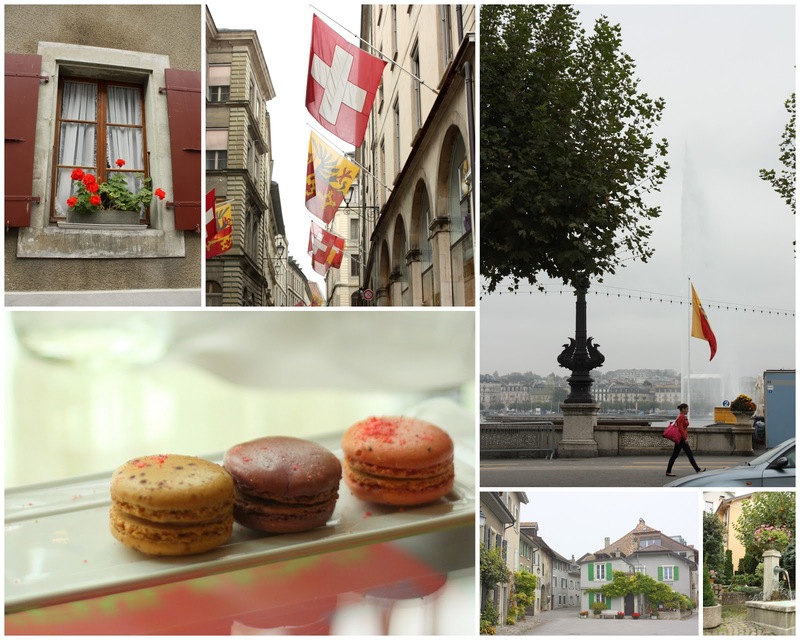 I have had the amazing privilege of traveling to Switzerland, too, and loved Lausanne. I know the vineyards on the terraced hillsides – on the way to Montreux, right? I think it&#39;s one of the most beautiful sights I&#39;ve ever seen. Sigh. Thanks for (virtually) taking me there again. –Lauren D.
Beautiful pictures Amy. Would love to see Switzerland one day. So glad the opportunity worked out for you both. Just beautiful! I can&#39;t go, so it&#39;s nice to see it from your perspective! Thanks for sharing. I feel a little homesick after seeing your pictures as I&#39;m a Swiss girl living in England. I&#39;m glad you enjoyed your trip to Switzerland. Prices are more reasonable when you get away from the big cities and towns like Geneva, Zürich, Lausanne and Basel. how lucky you were to be able to tag along. the pictures are fantastic. I&#39;ll be watching to see what kind of ornament you make with that fabulous ribbon. So pretty! I love travel pictures! Thanks for sharing! What beautiful pictures, Amy- thanks for sharing!! So happy you were able to make the trip and I too would be pinching myself- was this for real or just a dream!! :) What wonderful memories!! its official. we are now in a fight. i was okay with you being in paris without telling me (3 hour train ride I would have done for a few hours of fun shopping with you), but then you just had to go to switzerland (two hour train ride) and not tell me! thank goodness we are cousins cause I am sure we wont be in a fight for long. but I felt like I should just let you know that we are in a fight. Wow! It looks gorgeous! 🙂 Someday… I&#39;ll get there, too! I love visiting foreign lands and immersing in their culture. So great. Glad you enjoyed it so much! What a fabulous trip! 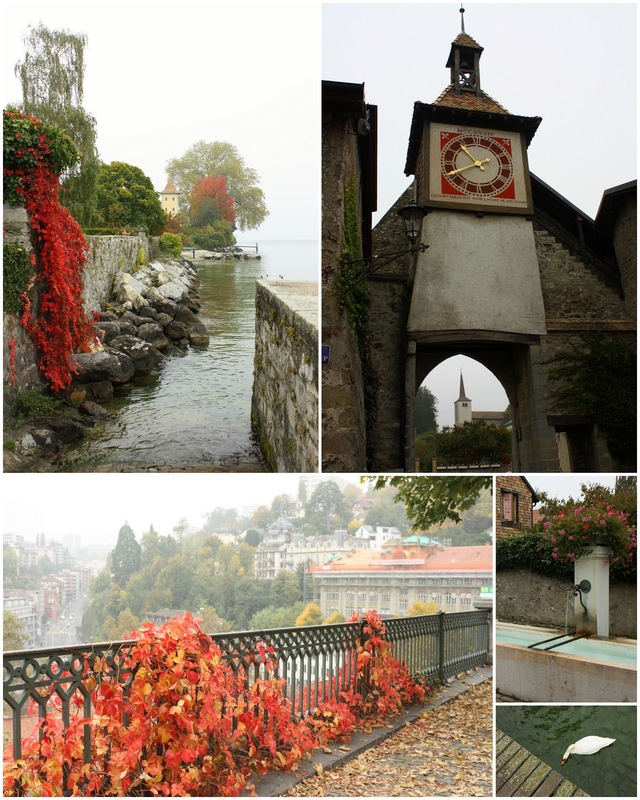 I&#39;ve been to Interlachen in Switzerland and loved it. Such a beautiful country! I love travelogues!! Beautiful photos are always so inspiring! Thanks for sharing and It&#39;s always good to know you had fun! Yay for you two! What a great opportunity to steal away together 🙂 And your photos are breathtaking! There&#39;s nothing wrong with non-quilty posts! First, being of Swiss ancestry, I enjoyed the photos. Also, quilters get inspiration from all types of sources. Several of your photos offered great color combinations for inspiration! That looks like a fabulous place to visit Amy. So glad you made it happen. Oh, you lucky girl! Your photos are beautiful and it sounds like you had a grand time. Switzerland is one of my favorite places. If your hubby goes back you should try to get to the mountains around Interlaken. You can hike up there in the summer and there are lots of cows with those hugs swiss bells around their necks — you&#39;ll feel just like Heidi LOL! What a great post. Yes Switzerland is beautiful and EXPENSIVE! Oh my goodness…I have come back to read this post over and over…thank you for sharing the loveliness! I just ran across your blog this evening and this post caught my eye. I&#39;m Swiss but I grew up in the States. I&#39;ve visited Geneva and been in that very same antique book shop. :)<br />I taught my teen cousins in Luzern to quilt on my last visit and brought all the fabrics with me. The Swiss prices are crazy!<br />Long live Bernina!